Election night was far from over - though there were enough results making clear Democrats were sunk - before blame for the Republican victories was put on President Barack Obama’s delay of action on immigration. DREAMers and Latino advocates who had loudly criticized the president, boastfully tweeted their versions of “we told you so” as Democrat defeat after Democrat defeat rolled in. “Hey Dems, how’s ignoring Latinos working for you today?” Erika Andiola, a leader of the DRM Coalition that advocates for young immigrants here illegally, tweeted early Wednesday morning. There had been angst about Latino turnout since the end of summer when President Barack Obama said he would delay plans to take executive action on immigration. The move that was intended to keep Republicans - already threatening to roll back the president's executive action on behalf of young immigrants and threatening to sue him for steps taken on health care - from using deportation relief to rally the base against vulnerable Senate Democrats. Latino groups and advocates found themselves walking a tightrope through the blowback. They tried to appease a vocal, young constituency that had been pressuring more established Latino groups such as National Council of La Raza, to hold Obama accountable. But the groups also did not want too far and dissuade the usually low-performing Latino electorate from turning out. Democrats already were in difficult waters going into the election, even before Obama's move. The shutdown that had riled voters against the GOP was a distant memory in voters' minds. Their focus had moved to health care reform, its disastrous rollout and some of its quirks such as limited in-network doctors or premiums with high deductibles. The economic rebound still wasn't being widely felt and Congress seemed incapable of agreeing on anything. Add to that: Latino turnout in midterm elections is worse than other racial and ethnic groups. Expectations are that it will be about what it was in 2001, when it was about about 7 percent based on Census figures. Those figures always vary slightly from exit polling, as Pew Hispanic Center Trends Project explained in a blog post Tuesday night. A late October Pew poll documented some Latino disenchantment with Democrats. The poll showed a slip of support for the party from 65 percent in 2010 to 57 percent in 2014. The poll also showed that 54 percent of Latinos felt immigration wasn't a deal breaker in their voting decisions. 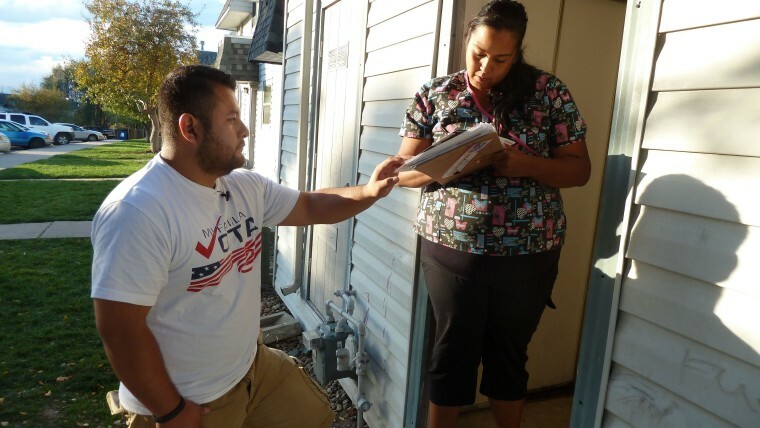 By the end of campaign season, Latino advocates were feeling better about where things stood. Workers were out in force registering voters and Spanish-language ads seemed to be more numerous. Surveys were giving the advocates reason to be confident. A Pew Research Center survey of Latinos showed just 9 percent of registered Latino voters surveyed considered themselves angry about the delay. Even polling by Latino Decisions, done for some of the very groups criticizing the president for the delay, showed just 36 percent gave immigration reform as their primary response when asked what is the most important issue facing the Latino community that politicians needed to address. But then the red wave hit Tuesday night. Alfonso Aguilar, executive director of the American Principles Project's Latino Partnership, said it is "dumb" and oversimplification to make Obama's delay of executive action the sole culprit. "At the end of the day, Hispanics are hurting and it is the economy and like the rest of the middle class ... Latino poverty is over 23 percent, the unemployment is higher than the national average and this is the key, median household income has gone down," Aguilar said. "The jobs being created are part-time jobs and not full-time jobs. Seeing prices going up is hurting. He went on to say that Democrats had pandered to Latinos and that showed in GOP Rep. Cory Gardner's win over Sen. Mark Udall in the Senate race for Colorado, where Latinos were about 13 percent of voters Tuesday. Exit poll data for Latinos was not available for Colorado. A poll by Latino Decisions for immigration and Latino advocates, the AFL-CIO and a Democrat leaning group, said Udall was the overwhelming Latino favorite at 71 percent. Early in the campaign, the GOP had said it could do better among Latino voters by actually getting into the community, listening to its residents. New Jersey Gov. Chris Christie had given an early demonstration of how this strategy works when he pulled about half of the Latino vote in his 2013 re-election win. "The RNC has been involved in communities across this country, building relationships and listening to voters," Republican National Committee Chairman Reince Preibus said in a statement. "We built an unprecedented data and digital operation, allowing us to reach voters and equip a winning ground game. I want to thank all of our supporters, volunteers, and donors who made this possible." Latino Decisions pollsters found 55 percent of Latino respondents to their survey had not been contacted about voting or registering to vote this election cycle. "Most of that falls at the feet of candidates and campaigns," said Matt Barreto, one of the Latino Decisions pollsters. On the strategy side, the fact that several key Democratic Senate candidates in tough races "ran away" from President Obama and from the administration's actions on health care and a recovering economy was a "horrible mistake," according to University of Maryland political scientist Stella Rouse. "Democrats let the Republicans frame the story. Look at the falling oil prices and unemployment numbers, look at the stock market - you didn't hear any of that," said Rouse, saying that was a missed opportunity with Latino voters. "Democrats didn't push against the Republican narrative," she said. Experts also point to the fact that midterms are elections where white voters simply are a large part of the electorate and vote, as reported by the Washington Post. "We know the coalition of young people and Latinos wasn't high," said political strategist Lorena Chambers, who created a Spanish-language ad for the Udall campaign. "Those who came out were older white guys," Chambers said. "So those who do come out and vote now have a huge voice on Capitol Hill" and Latinos won't have that voice until they get better voting numbers. Henry Muñoz III, a former Democratic party official and Obama backer, said the failure of Latinos to make strong showings this election are significant for immigration reform. "We have delegated our future to a group of people who clearly who do not have our best interests at heart" Muñoz said. "We have now representatives who I question whether they will take the action necessary to help us with the defining human rights and civil rights issue of our time." Attention turned quickly to the promise Obama made after delaying, that he would act before the end of the year. "Is it going to be half a loaf or a full loaf?" Rep. Luis Gutierrez, D-Ill., said in an MSNBC interview with Hardball's Chris Matthews. He said he's encouraging the White House to act for all immigrants and warned if he doesn't, there will be "a fight for the soul of the Democratic party." "We raise the minimum wage for all workers. We seek justice and marriage equality for all gay people. We do (for) all women ... rate of fair pay for them. We should do the same thing for immigrants," Gutierrez said.